ADJ’s popular Event Facade has been upgraded with an even more compact design. 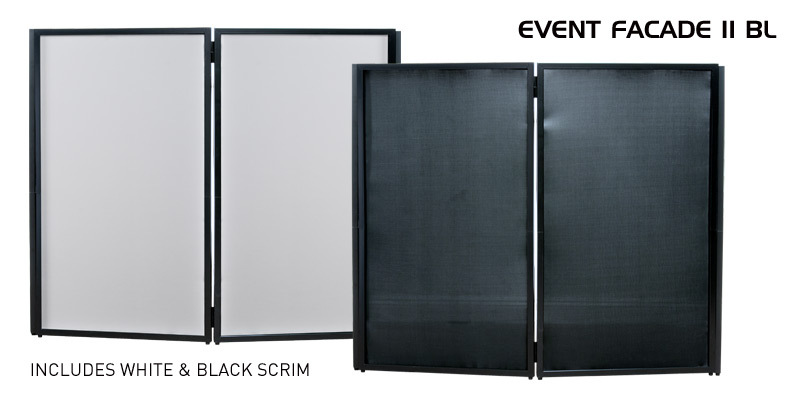 As with it’s predecessor, the new Event Facade II is available in two versions: the Event Facade II BL, which has a black frame, and the Event Facade II WH, which has a white frame. 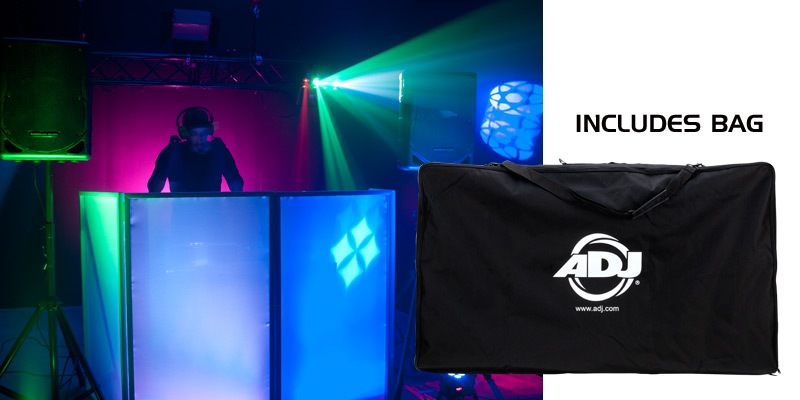 The original ADJ Event Facade proved immensely popular with a wide variety of sound and lighting professionals for a number of different applications. The easily portable and quick to setup facade has been utilized by hundreds of mobile DJs and entertainers for concealing their equipment while simultaneously creating an elegant and professional look. It has also been embraced by lighting and audio technicians for adding a neat finish to front of house positions at conferences and other events, and it has even been applied to completely different situations, such as exhibition stands. Wherever an aesthetically pleasing frontage is required, the Event Facade is the perfect solution. The new Event Facade II takes the compact nature of the original product and extends it to another level. As with the original, the new version features four frames that easily slot together using removable hinges to create a free-standing facade that can be positioned around a DJ booth or other equipment setup. However, to make the new model even more portable, each of the four frames can split in half. This means that the amount of space required for storing and transporting the facade can also be halved. This extra step in the setup and breakdown isn’t required, so if you’d prefer to leave each panel fully intact to speed up the process you can – and the supplied carry bag is large enough to accommodate the full panels. However, if you have limited storage or vehicle space, you now have the added flexibility of further reducing the amount of space required by the Event Facade II. 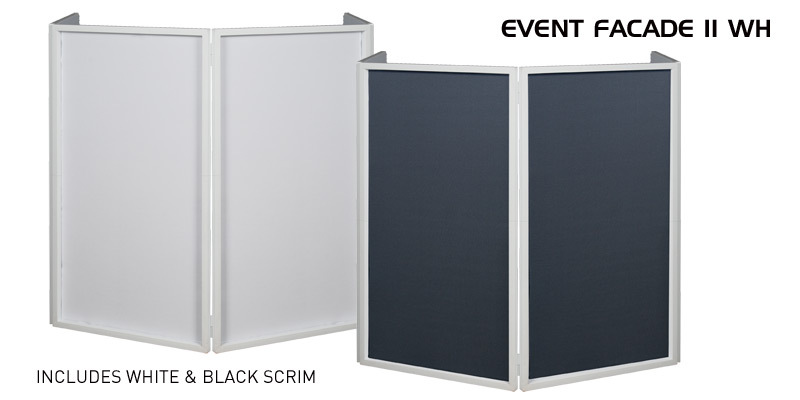 Both Event Facade II models are constructed from strong and lightweight metal and are supplied with black AND white scrim panels which easily attach to the metal frames using Velcro. This allows the flexibility of using different scrims for different events, whether a subtle black finish or an eye-catching white look is more appropriate. It’s also possible to interchange the scrims for a variety of different black and white color combinations, while LED wash fixtures positioned behind the facade can be used to cause the white scrims to glow in any color you choose. All of the supplied scrims are fire retardant and can be hand washed in cold water to maintain their clean look. Weighing in at 36 lbs. / 16.5 kgs, the Event Facade II is easy to carry and, requiring no tools, is extremely quick and simple to setup. Each of the four individual panels measure 27.5” x 1” x 47.25” / 700 x 25.4 x 1200mm, which means when connected together they create a facade that is 27.5” (700mm) tall and 110.25” (2800mm) wide. This is big enough to wrap around even the largest of DJ consoles, while the flexibility of the Event Facade II means that – by pulling forwards the join between the middle two panels – it can also be arranged to fit into compact spaces. The supplied carrying bag – which helps with transporting and storing the façade, as well as ensuring that it is kept looking its best, measures 49.75” x 30” x 5.5” / 1260 x 760 x 140mm. With a choice of white or black metals frames, both white and black scrims supplied as standard, and a new split design for its frame sections, the ADJ Event Facade II is suitable for all kinds of applications. It offers an elegant, yet customizable, look and is extremely quick to setup and compact to transport, making it the ultimate portable facade for sound and lighting equipment setups.